The last couple of months saw a ‘mooli’ obsession in me. A vegetable that never makes its appearance on my dining table was given a chance – by all three of us. 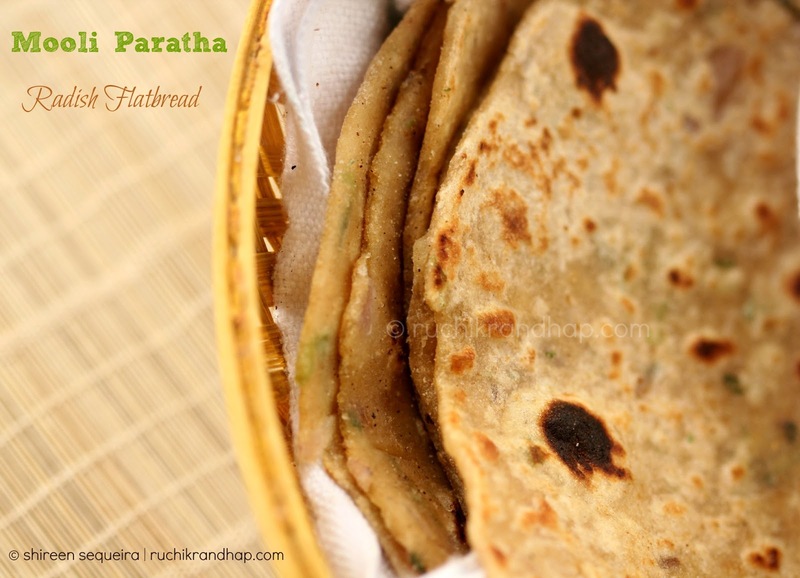 I had found a nice recipe for a paratha (flatbread) that is a great way to disguise veggies that have no takers. It makes for a great breakfast option too – nutritious, delicious and quick. It is fairly mess free and keeps longer (in terms of shelf life) – a great option for those who want a snack on the move. Parathas are a much loved breakfast option in my home – we just wolf them down with a generous layer of mayonnaise or cheese spread. However, I had never tried making these before and was quite apprehensive as both Roshan and I have never liked this vegetable especially because of its pungent smell and mediocre taste (which I now realise was mainly because of the way it was prepared). Post mooli paratha I have decided to give every vegetable a second chance. If something is prepared differently – in at least 3-4 different ways and still doesn’t get any ‘likes’ we will then veto it. I am glad I tried out this recipe and have one extra option for breakfast. Thanks to my friend Anupama Michael from a food group on FB for this lovely recipe! 1. Place all the ingredients in a large flat bowl (meant for kneading dough) and mix to resemble bread crumbs. Keep aside for a few minutes as the radish and onions will leave some water. 3. Pinch out lemon sized balls of dough and on a clean working surface roll out each ball into a flat paratha. Fry on a hot skillet/tawa till golden brown on both sides. Drizzle ghee or oil to aid frying. 4. Serve hot with thick curds or pickle (traditional serving suggestions) or cheese spread or mayonnaise. inter is the time for such delicacies. love it. Healthy & tasty..I love mooli parathas!!! mom also grinds some ginger, garlic and green chillies and adds it when kneading dough,.Makes it even more flavorful..Yours looks so soft & perfect Shireen!! loved your mooli theplas..delicious,easy to cook ..great breakfast option! 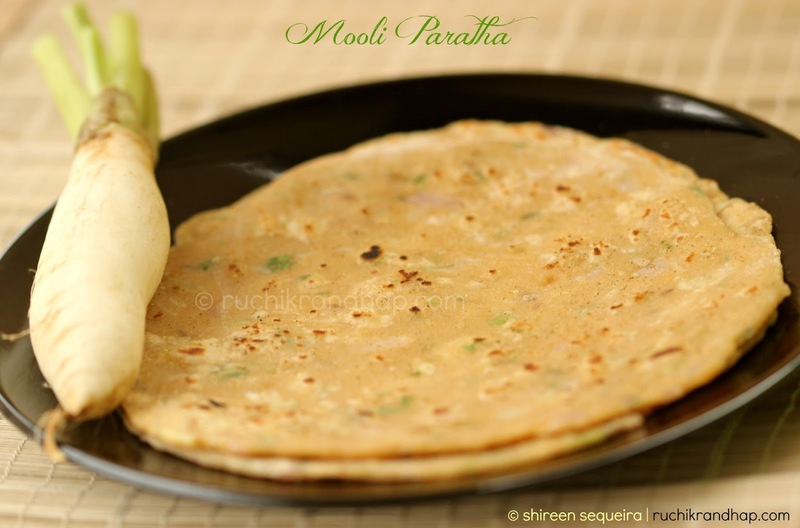 adding onions is a nice twist to mooli paratha.. looks nice ! They look very delicious.. love parathas anytime. One of my favourite paratha, havent made since a long,inviting. Hi Juliet, thanks for writing in. You need to use just the radish (root) and not the leaves. All the best!